Are you tired of getting lost with your old Garmin or Rand McNally ? If so we might have the solution for you ! Q: How do I update my TruckWay GPS ? A: You will need to contact me(The seller) and I will provide you a download link with a Step-by-step and video guide on how to update it. Q: How do I charge my TruckWay GPS ? A: You will need to use the truck/car charger we provide, plug it in your 12V truck/car socket, turn on the truck/car and let it chage for about 30 minute for full charge. You cannot use the USB cable with you home plug adapter because it is only 5V and wont charge it. If you have any question please ask me, I'm at your service ! Click add to cart and enjoy the difference ! EXCELLENT CUSTOMER SUPPORT/SERVICE - TruckWayGPS is a proud North American company. We offer 24/7 Customer support/service. We are actually real human that will answer you. FREE LIFETIME MAPS - We provide Free Lifetime Maps for USA & Canada. Our maps are really accurate and easy to use. Just send us an email to get the latest maps. 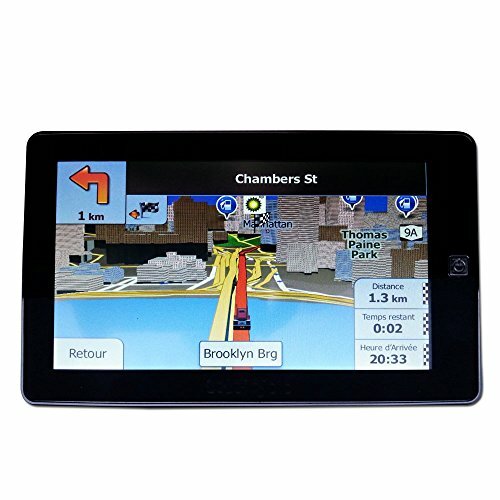 SUPERIOR NAVIGATION DESIGN - TruckWayGPS provide 3D maps with 3D building. 2D Maps is also available. CUSTOMISABLE TO YOUR NEEDS - Our Truck GPS specialized in truck driving. It take in consideration the height ,width ,length, weight , product you transport(Dangerous goods) It has Low bridge, Road Sign and No truck etc... plus a lots more! HIGH QUALITY TOUCHSCREEN - 7-inch LCD Touch Screen High Definition 800 x 480 pixels. Really easy to use with only your finger. View More In Vehicle GPS. If you have any questions about this product by TruckWay GPS, contact us by completing and submitting the form below. If you are looking for a specif part number, please include it with your message.